Jungle Red Writers: Red, White, or Rose? HANK PHILLIPPI RYAN: Because it is just us, I can tell you this. I was on book tour, and my face started going crazy. No one would have noticed, but I did. I figured it was maybe an allergy to the cleaning stuff on hotel sheets, or something. But the doctor said I should have an allergy test. Okay, I said, as if I had some control over the universe. But listen, I said. I better not be allergic to wine. I turned out not to be. Hurray. And it’s still a mystery. When, my Mom died, each of us kids go part of the wine cellar. Some examples. Are they still good, Nadine? Or is it too late? Nadine knows. And here's why. Thank you, Hank and the Jungle Red Writers, for having me on your blog! My debut novel, DECANTING A MURDER, released in May and I’ve frequently been asked, “What is your favorite wine? Is it in the book?” Every chapter is paired with a wine, which means there are thirty-two possibilities that one is my favorite. But may I say that I love them all? Let me explain. Every bottle of wine has a story behind it. From the history of the winery and the location of the vineyards to the type of soil around the vines and the way the sun shines on the grapes and how the night air cools them. And that’s just the beginning. Then it’s harvest time when the grapes are gently plucked from their vines and pressed, fermented, and aged until the wine is ready to be bottled. When I pour a glass of wine, I think of the time it took to create it and the elements involved. So many factors play a role in forming the magic that becomes a bottle of wine to be sipped, savored, and enjoyed. I’m fortunate to write about something I love but just how much do I love wine and the story behind each bottle? I camped in a Toyota Previa for over a month in order to visit every wine region in France. Yes, you read that right. I camped in a van for over a month and I’m not exactly a fan of camping to begin with. When I mentioned to my husband that I wanted to visit all the wine regions in France, we researched the best way to do it all in one trip. Planes and trains didn’t go everywhere we wanted to visit and hotel prices can quickly add up. The best solution? Rent a car and drive through the wine regions. Oh, and sleep in the car too. NADINE: I wasn’t thrilled with the idea at first, but I wanted to see the regions so off we went. For four and half weeks, my husband and I lived in a minivan, which had seats that folded into a bed, as we toured every wine region in France. 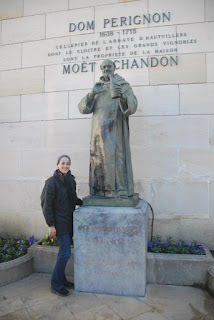 We drank Champagne in Champagne, Bordeaux in Bordeaux, Chablis in Chablis, and even Cognac in Cognac. We also had some mishaps such as GPS sending us into a field of cows and an incident that matched our tire with a curb (the tire lost) that led to an all day, multi-store search for a new tire. 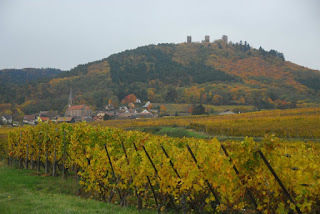 With every region we visited, I appreciated the history of wine even more. The sight of vineyards filled me with joy and I found myself wanting to know the story behind every single bottle. It’s something my character, Katie Stillwell, and I have in common. 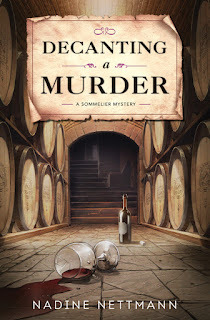 Although DECANTING A MURDER is set in Napa Valley and the second book in the series, UNCORKING A LIE, takes place in Sonoma, elements from my journey have made their way into the books. From the references to France or the fact that Katie’s uncle owns a French winery to the way the light reflects on the vineyards in the early morning. At the time, I didn’t know it was research for my novels but it’s a thrill to relive those moments of magic, even if it’s just having Katie walk by a vineyard. And as for my favorite wine, although I love them all, I’m currently enjoying cool glasses of Riesling and Pinot Grigio during this hot summer. What is your favorite wine? I’d love to hear! HANK: And I will happily offer a copy of DECANTING A MURDER to one lucky commenter! Salut! Nadine Nettmann, a Certified Sommelier through the Court of Master Sommeliers, is always on the lookout for great wines and the stories behind them. She has visited wine regions around the world including Chile, South Africa, Spain, Germany, and every region in France. 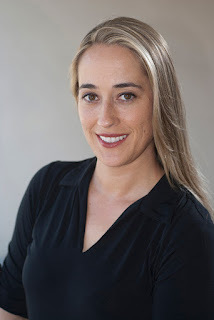 When she's not visiting vineyards or dreaming up new mysteries, her travel articles have appeared in AAA Hawaii, New Mexico Journey, Modern Luxury Hawaii, and Inspirato. She lives in California with her husband. Katie Stillwell focuses on two things in her life: work and practicing for Sommelier Certification with her blind tasting group. The exam was supposed to be the hardest part of her week, but that was before a body was found at an exclusive Napa Valley winery party. When all the evidence points to Katie’s best friend, the outspoken and independent Tessa, Katie drops everything to clear Tessa’s name. Using her deductive wine skills, she tries to track down the real killer. But when repeated attempts are made on her life, Katie discovers that everyone’s secrets must be uncovered—including her own. 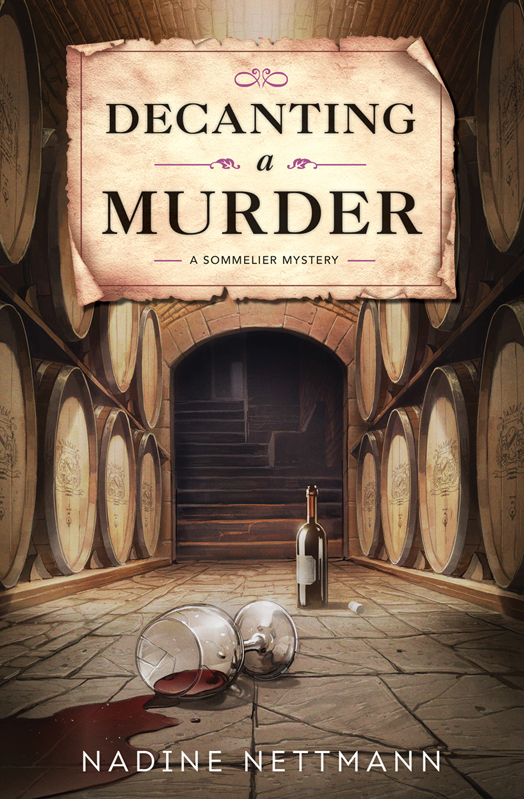 Goodness, wine, mystery, and murder . . . I must add “Decanting A Murder” to my teetering to-be-read pile. Congratulations on your first book, Nadine. Favorite wine? Mostly we have rosé or white wine as many of the red wines [although they are quite lovely] give me a headache. But there’s a local winery that makes an exquisite blueberry wine that I must confess is my absolute favorite. Wine and books. Doesn't get any better. Decanting a Murder has all the elements that I crave in a book. Your travels through France are awe inspiring, as is the fact that your marriage survived them. Kudos to you and your husband. My favorite wine? Right now I'm partial to the wonderful cabernet sauvignons of Chile. A salesperson at Total Wine introduced me to them as good table wine, and indeed, they are. I also love theme wines. Anyone else familiar with Chateau la Paws? Again, table wine on the low end, but the hook for me? The labels feature dogs from no kill shelters seeking forever homes AND a portion of the sales go to support no kill shelters. Drinking that wine is nearly a civic duty. Hank, what a wonderful legacy your mother left you and your sisters. The gift of wine is indeed a gift of love. Wine, mystery and murder sounds like a great combination, Nadine. Congratulations on your first book. 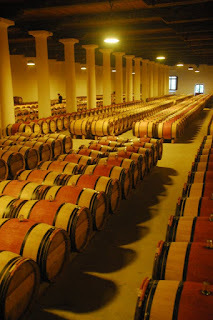 I love travelling to both Napa and Sonoma for wine holidays, and envy your France wine journey. Hank, what a great inheritance from your mother. I hope you savour each bottle with love and fond memories. My favourite wine? For reds, I would say an old vine zinfindel from Sonoma County, CA. And for whites. I would go with either a riesling or gewurtztraminer from closer to home, Niagara Region, Ontario. Nadine, that trip sounds wonderful. It was nice you were driving around in that van, because invariably wine tasting puts me to sleep. I wouldn't do it unless someone else were driving and I could sleep In the back. My favorite wine Currently I'm a big fan of dry Viognier. Red wines give me a headache so though I love them, I avoid them. I've become a big fan of hard ciders -- had them first in Normandy. Congrats on the wine series Nadine! I know i'm in the minority, but I'd take the car camping but skip most of the wine:). What a fabulous way to see France. And the new book sounds so good... TBR, here we come. Would love to hear more about your experience as a sommelier! Hi Nadine! Wine and books? Count me in! I love all wine, but especially champagne (or Champagne). What's your opinion of stemless wineglasses? We've been drinking the Reds from Villa Antinori. We served them at our wedding because of the story behind them. This was a famous Italian family of vintners where the men were running the business, but after 26 generations there were no more male heirs and two sisters, Allegra and Alessia, took over the business. They were profiled on 60 Minutes. For whites, I will always default to Our Dog Blue from Chateau Morrisette (out of Virginia). Was the first wine my husband and I ever drank together and it too was featured at the wedding. Good morning you all! And I am happy to see this is a subject dear to our hearts. It always sounds so wonderful to go on a wine tour, but if I had a sip of wine during the day I'd be instantly asleep. Boom. Out. Somehow I can't have wine until it's dark. Is that just--what, habit? Weird? Psychological? ANd the headache thing. White wine gives me a headache, Instantly. ANd I know that doesn't make any sense. And yes, we also inherited bunch of stemless wineglasses! which seem so weird. But they certainly are ..safer. I'd also love to know, like Susan, if they change the wine at all. And yes, thank you Grace and Kait, it is a lovely inheritance. But it seems like the only way to find out if the wines are still good is to open them..and then --the die is cast. Plus, I have to stop "saving" them. Can't wait to read this series and tell my oenophile sisters about them! Current favorite summer wine is Côté des Roses, a wonderful rosé with a fabulous bottle. Hank, I got a rash on my face from the pillow on the airplane on my honeymoon! Of course I do have the wonderful story of having to go to St. Marys Paddington our first day in London. Wine, books, writing... I'm going away for a weekend of nothing but writing with my Sisters in Crime chapter. I expect much wine. I'm taking a bottle of pinot grigio (which I like). Also a fan of a good chardonnay, merlot, or shiraz. Essentially, I like wines that are not too dry, but not too sweet. Although I do like a reisling or gewurtztraminer on occasion. But during these hot summer months? Our favorite is sangria - and we've found a really nice Spanish one that is already bottled, which means we don't have to buy a whole bunch of ingredients and mix (not that we're opposed to that - but getting it from the store is so much easier). A friend mentioned that she made a white peach sangria that I'd love to try. Grace, I'm from near the Niagara region (US side) - people are amazed at some of the really lovely wines you can get from there. This time last year we were getting ready to go to the Dordogne. And our first stop was St Emilion. While camping wasn't considered, we did rent a car and tour around the sud-ouest for a couple of weeks. French wine varies from good to outstanding I think. It's very easy to have a case shipped home,too. My favorite California winery is Franciscan, have never been disappointed. We are in western NY now, but we aren't fans of the Finger Lakes wineries, were spoiled by all those years in California. St. Emilion! One of my very faves, Ann! And yes, we had Brunello di Montalcino shipped home from Italy. We HOARDED it. And almost waited too long! What a fun trip that must have been, Nadine! Thanks for sharing it with us. Congratulations on your book. My middle daughter spent ten months in Europe last year, nine of them in a camper van she bought to live in (which she named "Honey"). I'd love to do something like that, but on a smaller scale, like France only. To vineyards. My favorite reds are zinfandel, which is America's wine and largely unsung, and malbecs. For a long time white wines gave me instant hot flashes, but that ship seems to have sailed (good riddance), so now I happily drink pinot grigio. But when I was in Austria in June I discovered a new favorite, Gruner Veltliner. Delicious. And Hallie, hard ciders for me, too! Especially Clos Normand or the Crispin with the blue label. So light and refreshing, especially in the summer. Hank, every year the MRR chapter gets together for a weekend retreat. The first two years I did it (but not the first two years it happened), we were all in a rental house in the Laurel Highlands. Then we did a retreat center in Greensburg. On those weekends, we held some workshop sessions. This year we are going back to the Laurel Highlands. One lodge that a member found for us and it is a weekend of pure writing. No classes, no workshops, just writing and camaraderie (and wine). I forgot to mention one of my favorite "novelty wines." Chocolate wine. Red wine combined with chocolate in a bottle. I mean...come on! Who can resist? Congratulations on the book, Nadine! It definitely sounds like my "cup of tea" (or, shall we say "glass of wine"?) - I've already put it on my must-read list. I like all wine, mostly red - a favorite is Arrogant Frog Pinot Noir from France; but roses are really nice in the summer - my current favorite is Puech-Haut, Saint Drezery. I'm reading the comments and responding out loud (It's OK, I'm alone in my school library) "Oh, yes, Gruner Veltliner! Wait, zinfandel! Ooh, but I like hard cider, too!" So I will just throw another wine onto this delicious list. My husband, the non-wine drinker, bought me a case of Les Combettes Pouilly-Fuisse from Chateau Fuisse. Luckily we have neighbors willing to drink it with me! I just finished reading Le Road Trip by Vivian Swift about her honeymoon travels through France, and the section on Bordeaux made me want to hop on the next plane. Maybe "Decanting a Murder" would save me some money, if it makes me crave a trip to Northern California instead! Aren't you and your husband adventurous?! My favorite wine is a fruit foward, full bodied red. Mary, glad to see you know about the great wines we have in the Niagara Region. The number of wineries has grown significantly over the past few decades, so there is lots of choice, both whites and reds. And I should have also mentioned the famed Niagara icewines which are a great dessert wine. I often give those out as gifts to out-of-town visitors. I've never tried hard cider--but yay, will do! Mary Sutton, when I heard about "chocolate wine" I winced. I thought: that is--forgive me--disgusting. Then, to be polite, I tasted it. OH! You have to forget it's called "wine" and just go with it. Sip it like a liqueur. Yummy! LibraryLady--what a terrific image! I can picture you! Grace, you're so right about the number of wineries--everywhere! There are now wineries and vineyards in each of the 50 American states; isn't that astonishing? And when I was in Tuscany I was stunned to see how much of the land has been overtaken by vineyards, way more than on my first visit there in 2001. As much as I love chocolate, I can't get behind chocolate wine. There are two kinds, and I'm not wild about either. One looks like chocolate milk with a reddish tint, and the other is like a liqueur. The milky one tastes more like Bailey's to me, so if you like that kind of drink you might also like the chocolate wine. The other would be good on ice cream, no? Your road trip with your husband in France sounds like fun! When you stopped for petrol, did you see big shopping centers? We have mini markets next to gas stations in California. In Europe, I saw big places right next to petrol stations like a cafeteria, cheese/chocolate shop, depending on which petrol station you stopped at. Another lifetime ago when I studied a semester abroad in England, I had this excellent port that tasted like peppermint candy. I think it was from Portugal or Spain. Never found another port like it in California. Several years ago, I went to the Napa Wine Train with friends (years before the fiasco this year). At the train stop before we got on the train, we tried different wines. I really liked this geurwitzer (sp?_ because it was very sweet. I always eat something with wine if I drink wine at all. I am very picky about which kind of wine I drink. Since I have a sweet tooth, I like wine that tastes more like fruit. Hank, what a wonderful inheritance. are there stories behind these wines? You mentioned headaches from a certain kind of wine. That reminded me of my tour group. We toured a wine cellar and tried different wines. The only one I liked was the sweet dessert wine. Others were dry and tasted sour to me. Someone in my tour group mentioned that sweet wine gives her an headache. Another favorite is homemade sangria because it includes lemonade and lots of fruit! Very sweet. Grace - ice wine! Totally forgot about that. Oh, it's yummy but I have to remember to limit myself to one glass or I'll get totally knocked over. I'm going home to Buffalo/Hamburg over Labor Day weekend. Maybe a trip to the local wine store is in order. Hank, yeah. More like a liqueur than true wine. And some are better than others. The nice thing about this weekend? I don't have to go anywhere at night so I can drink as much as I want (balance issues mean I limit my alcohol consumption when I'm not in my own home). Thank you for leaving such lovely comments! I love reading all of them and hearing about your favorite wines! Joan, thank you so much! And I’m intrigued by the blueberry wine! I’ll have to try it on my travels! Kait, thank you! It actually made our marriage stronger though I don’t know if I would camp for that long again. 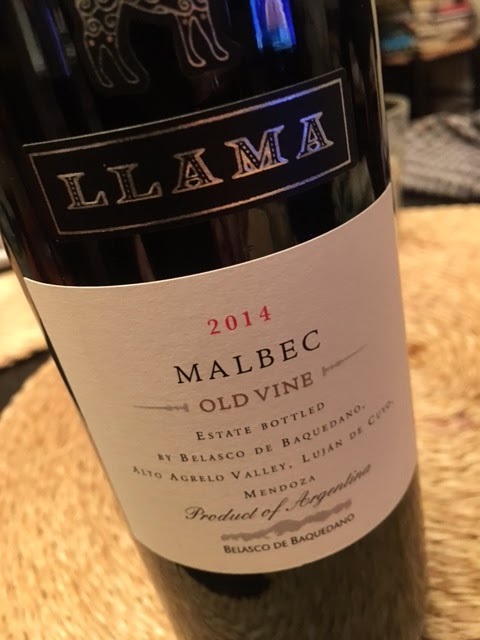 I love Cab Sauv from Chile and was fortunate to visit the wine regions there, but we stayed in a hotel this time :) And that’s great about Chateau la Paws! Grace, thank you! I’m a big fan of old vine Zin and I love a good Riesling. Hallie, thank you! That could be an interesting wine business — Taste and Sleep — where you can visit wineries and then sleep between them. I love Viognier and I still need to try more hard ciders. I’ve only tasted them a few times but I enjoyed them when I did. Lucy, thank you so much! It was the perfect way to see the wine regions and a lot of fun. Where’s your favorite place to camp or go on a camping trip? Kristopher, I love the story behind wines! It brings so much more depth to the wine and the journey it has been on from the day the vines were first planted to the moment the wine is poured. I haven’t tried Villa Antinori yet but it’s on my list! I love that you chose such special wines for your wedding! Hank, it's wine made from grapes that have frozen on the vine and then were pressed. It's very sweet. I heard a story from a friend about a Brit who visited a vineyard in France, and after being shown all over the vineyards and the magnificent chateau, the Brit and the owner of the vineyard were tasting wine on the chateau's magnificent terrace. The Brit was a bit tired of the Frenchman's bragging about everything by this time, but asked where the wine they were tasting came from. The Frenchman pointed down from the terrace and said that it came from the vines right down there. The Brit took another sip and said,"It doesn't travel well, does it?" It may be a "guess you had to be there story," but I always thought it was pretty funny, and of course it was told to me by a British friend in the wine industry. I've always loved Cabernet Sauvignons. Is it true that the French have the trademark on the term Champagne, and that anywhere else it must be called Sparkling Wine? to me and Nadine from IAN RANKIN! 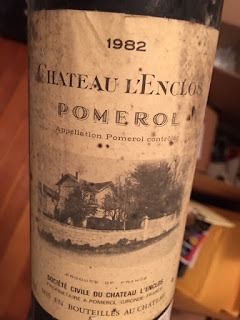 About my 1982 wine in the blog photo. "1982! 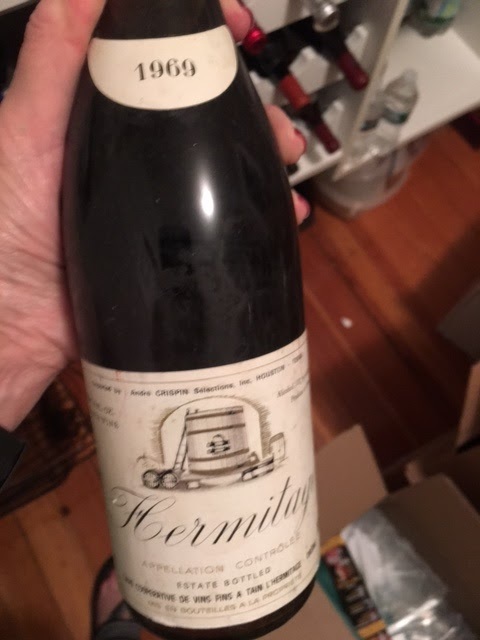 I picked grapes in France that summer - great wines…"
Atlanta, thank you so much! Rosé is perfect for the summer and I’m sorry about the pillow! Mary, that sounds like a wonderful weekend and Pinot Grigio is a perfect pairing! It’s been a while since I’ve had sangria — thanks for the reminder! I’ll have some soon! Ann, thank you! I love that you also drove through wine regions in France . There will be a book set in France at some point for sure. Karen, thank you so much! I love that your daughter named the camper van! We didn’t think to name ours, but it would have been fun if we did. I love Grüner Veltliner! I need to try some more hard ciders. I’ve only had a few but I’ll try the ones you mentioned! Thanks! Mary, I haven’t tried chocolate wine yet, but I’m definitely intrigued! Linda, thank you so much! And I love that that you say “glass of wine” instead of “cup of tea” — I’m going to start doing that, too! And cheers to Pinot Noir! SEMS Library Lady, I’ve been responding out loud, too! That’s a wonderful gift from your husband and I’m glad you have great neighbors to enjoy it with! I visited Pouilly-Fuisse and both the area and the wines from there are wonderful. Libby, I was the reluctant adventurer, but I’m so glad we went on the journey. I tend to play it safe while he’s the adventurous one, so we create a good balance. And cheers to full bodied reds! Grace, I love ice wine! I haven’t visited the Niagara region yet but I have plans to go there in 2017. I’m looking forward to it! Great post! And what a wonderful concept for a murder mystery! 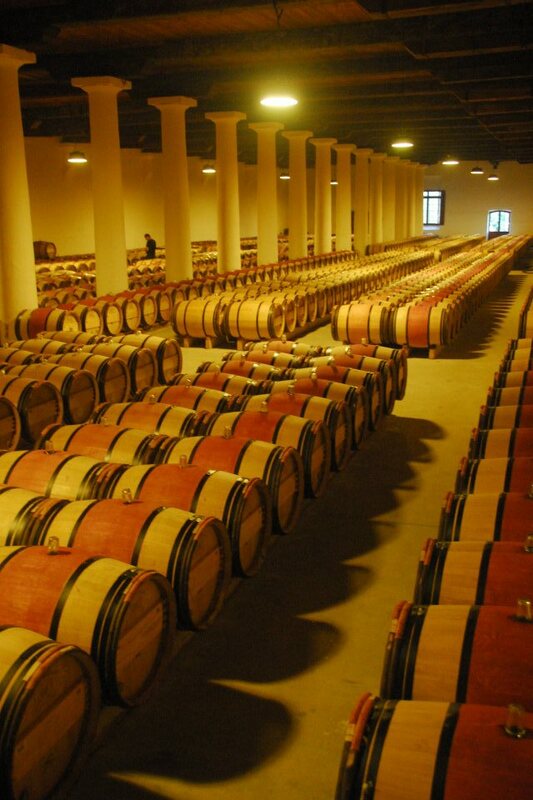 I love French wine--maybe because I know it better than other regions. I've visited lots of vineyards over the years and love that in France there are so many modest wines that are wonderful. In summer I drink a lot of rose from Provence, in winter more red Bordeaux and gigondas (my favorite Rhone). As for white--a lovely Sancerre will delight me any time of the year! Sorry about the typo in my earlier post. Hank, I’ve only had a few hard ciders as you haven’t tried them yet, I think we might need to find some at Bouchercon. Diana, thank you so much! That was my first Malice, too! I’m looking forward to attending again next year! I loved reading about the wine you tasted on your different travels. A few comments have mentioned ice wine and since you have a sweet tooth, you might like it too. Hopefully I’ll see you at the next Malice! Hi, Lark! I love Gigondas, too. And we are having fun this summer testing roses, too! My husband and I do taste tests, to see if they other can match wine to bottle. Celia, that’s too funny! And I love Cabernet Sauvignon. For Champagne, it has to come from the Champagne region to be called Champagne. If it comes from elsewhere, even from different regions of France, it’s sparkling wine. Hank, I LOVED that tweet! Lark, thank you so much! I’m a huge fan of French wine and ever since our trip, every bottle evokes a memory. I love all of the wines you mentioned and now I think I might have to open a Sancerre this week. Cheers to great wine! Hank, I love that you're doing taste tests! Have you been successful at matching the wine? Nadine, I love that you followed your passion with such adventure, willing to live in a van to accomplish your dream. That's dedication for sure. And, wine aficionados, especially those with your level of expertise, always amaze me. Your assertion that every bottle of wine has a story is intriguing. I'd be happy just to know what wine should go with what food. My favorite wine was Pinot Noir, but I read somewhere that red wine wasn't good on my stomach ulcers, so I switched back to Chardonnay. Of course, even that is a rare treat. I love the idea of wine with meals and a cocktail in the evening, but the truth is that I imbibe very little. That might change a bit in New Orleans in September, as I probably will have to sample some drinks there. Nadine, I was fortunate to have won your book Decanting a Murder last month, and it is in my short pile of books I'm trying to read before Bouchercon. I know it is going to be a great read. Hank, an ice wine is a wine where the grapes are frozen while they are still on the vine. They are then pressed when frozen - resulting in less liquid (which accounts for the higher cost and smaller bottles. This also results in a much sweeter wine, so they are perfect for dessert. Kathy, thank you so much! I hope to connect with you in New Orleans! Yes, we do pretty well…(but I fear it is often guessing.) We like to do a house wine versus a "great" one. Or a newly opened bottle versus one that's been open a while. The results can be surprising! SO: on my list: Ice wine. Hard cider. And hmmm..the Jungle Red wine flight at Bouchercon--with expert Nadine! We'll have to work on that! My favorite go to wine for summer is vinho verde from Portugal. Light and crisp and a little effervescent. I also like Bad Orchard cider. Yum. I was reading Lucy's Death in Four Courses last night and snorting at Hayley's reaction to wine descriptions from the expert.Coffee with a hint of graphite? Uh huh. Keep the pencil out of mine too. Can't wait to read your mysteries Nadine. With a glass of wine in hand. Pat, thank you! Cheers to Vinho Verde. I love the effervescence and it's perfect for this hot summer! Sounds really interesting. Thank you for the review.